Welcome to Warrior Jujitsu! The most effective self defense martial arts training and the coolest clothing in the Warrensburg, Whiteman AFB area! With the warm weather moving in, we're trying to move out our winter inventory! Top of the line brand name hoodies from American Fighter, Sprawl, and Punishment Athletics. All on sale for a limited time. Stop in and get yours while the sale lasts. Soon we will be packing them away for the summer to make room for newer summer lines. NEW PRO FIGHT AND TRAINING GEAR IN STOCK!!! 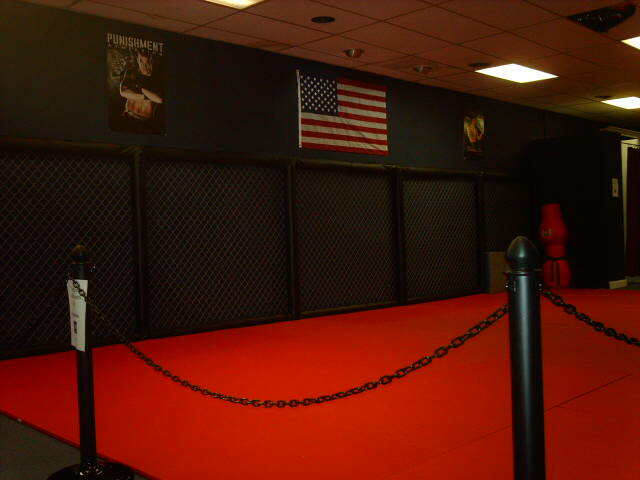 We now carry a complete line of training and fight gear for the professional cage fighter. Thai Pads, Fight Gloves, Training Gloves, Shin Pads, Professional Mouth Guards, Shock Doctor groin protection AND MORE! If you're a fighter or a trainer, bring you're fight team to WARRIOR JUJITSU for all your training needs! We teach real world self defense to Women, Children and Men. No hidden fees, no contracts! We also sell fight related clothing worn by your favorite UFC fighters. Brand names such as Punishment Athleics, Warrior International, KTFO, TapOut, and American Fighter! You can't find these names anywhere else in the Warrensburg area!